This document, prepared and approved by the Board of Directors of the Association of Academic Museums and Galleries (AAMG), with considerable advice from academic museum professionals nationwide, aims to assist academic museum staff and volunteers as well as those members of their parent organizations responsible for their success. These codified best practices draw from those of other museum organizations–American Alliance of Museums (AAM), Association of Art Museum Directors (AAMD), American Association for State and Local History (AASLH), and Association of Art Museum Curators (AAMC)–and are aligned with the categories currently used by AAM to better guide museums on the path to national accreditation or reaccreditation. Museums or museum directors that are members of any of the above are also charged to uphold the professional practices of those associations. We are deeply grateful to Max Marmor and the Samuel H. Kress Foundation for their support toward the printing and dissemination of this document. While all museums are educational in purpose, academic museums are unique in their mission to teach and train succeeding generations of students. Their primary purpose is to support the mission of their parent institutions. As learning laboratories, they advance research and student achievement. They build cross-cultural understanding; create cross-departmental and interdisciplinary teaching opportunities; strengthen analytical thinking and creativity; offer real-world work experiences; model inclusion and access; and further civic responsibility in their efforts to improve the lives of people in their communities. As object-based centers of research and teaching, they sustain on-campus learning. They often serve as the front doors of their universities, connecting town and gown, the academy and the public. 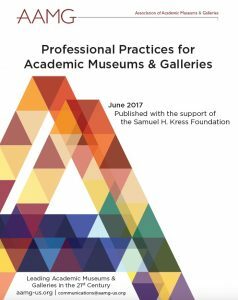 AAMG encourages museum directors, their academic supervisors, university administrators, trustees, and advisory boards to support and affirm these professional practices in their museums. By embodying excellence in their profession, academic museum staff can better serve the mission and goals of their parent institutions and their communities at large. They will be better informed to care for and interpret their collections, which represent our natural and cultural heritage, and better equipped to address the challenges facing our institutions of higher education, our society, and the world. In doing so, they will be recognized as essential partners in the enterprise of higher education. If you would like to contribute to this project, please send relevant documents formatted for general use and with the assurance that they have no copyright restrictions to info@aamg-us.org. Please state how the submitted documents have undergone external review.